All too often this news story remains something on the screen, in a far-away land, but then something happens which takes our breath away and brings the story back to our neighbourhoods and our streets. 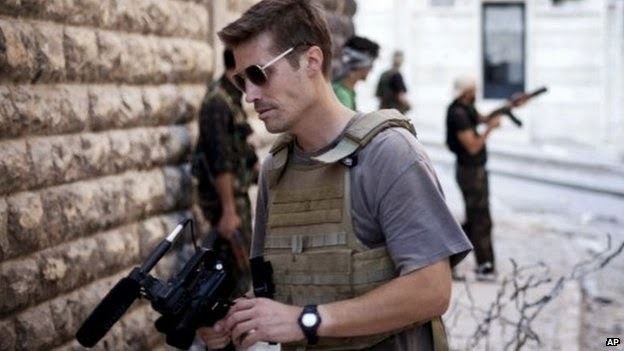 The murder of James Foley at the hand of a British ‘Islamic State’ extremist for me is just one such story. James Foley was unable to write letters to his family whilst being held by ISIS, because they were confiscated by his jailers. Instead he asked another hostage who was about to be released to commit a letter to memory. When that hostage was freed he dictated the letter to James' mother, Diane. Eighteen of us have been held together in one cell, which has helped me. We have had each other to have endless long conversations about movies, trivia, sports. We have played games made up of scraps found in our cell… we have found ways to play checkers, Chess, and Risk… and have had tournaments of competition, spending some days preparing strategies for the next day's game or lecture. The games and teaching each other have helped the time pass. They have been a huge help. We repeat stories and laugh to break the tension. And big John, how I enjoyed visiting you and Cress in Germany. Thank you for welcoming me. I think a lot about RoRo and try to imagine what Jack is like. I hope he has RoRo's personality! Grammy, please take your medicine, take walks and keep dancing. I plan to take you out to Margarita's when I get home. Stay strong because I am going to need your help to reclaim my life. Foley was not known as an especially religious man but the faith he reveals in his letter is in stark contrast to the extremist faith of his captors and killers. The letter reveals him as a prayerful man and his life’s work and story demonstrates how he ‘lost his life’ (to use Jesus’ expression literally) reporting these terrible events to the West. We meet Jesus this morning not in prayer in a war zone, but in today’s Gospel at Caesarea Philippi. Interest in His ministry is growing and people want to know more. So Jesus does a little survey - are people getting it? Are they getting him? So he checks it out with the disciples - they hear it all - the chatter in the crowd as He teaches, the exclamations as He heals and performs miracles. ‘Who do people say that I am?’ He asks. Some say John, some say Elijah but then there’s Peter squirming to say something like a kid in class with his hand in the air, ‘You are the Messiah, the Son of God!’ Bingo! But almost without pausing for breath, Jesus goes on to teach that it must all come crashing down - the triumphant of the Messiah warrior-king will not be crowned in glory, but in failure, suffering and ultimately death. The hopes of generations crushed. The headstrong schoolboy Peter at least had the grace to take Jesus to one side before blurting out his incredulity… Surely this can’t be… This is madness… Why… This Must. Not. Happen… And all of a sudden - Peter the one who get’s Jesus - is the adversary of God and must get out of the Way, the road toward His Divine purposes. ‘…If any want to become my followers, let them deny themselves and take up their cross and follow me. For those who want to save their life will lose it, and those who lose their life for my sake will find it…’ And this is where I struggle. I don’t want to deny myself. I have spent much of my adult life accepting and gradually liking and on my best days, loving myself as you told me I should Jesus. I am finally at ease with who I am and now You tell me Jesus to deny myself - my successes and shortcomings? I’ve just come to terms with these. This seems to fly in the face of the big story of God and people as told in the Bible where your Father effectively says - I love you; I want to be with people like you; will you come and be with Me? So what is it that I should deny Jesus? My gifts and talents, my self-worth, my personality, my hopes, dreams and desires? What needs to decrease in me that means that You increase? Surely self-denial isn’t a form of self-flagellation? Self-denial does not mean embracing suffering for its own sake. Jesus you spent much time alleviating needless suffering or oppression whenever you encountered it. Saying no to me and my priorities and drives allow the possibility of me saying yes to you and yours, but as Syrian and Iraqi Christians remind me that this sort of self-denial comes with, sometimes, enormous risks. Then there’s the cross taking. I have always understood Jesus that you took the cross and suffered and died so I don’t have to. So sorry, but I reject “take up your cross” as some sort of victimisation or martyrdom for its own sake. Yet, if the cross is a symbol for defiance of empire? If the cross is representative of the absolute certainty of the incarnation? If the cross is a model for resistance to the status quo? If the cross is a reflection of our human propensity to eliminate the voices that call for justice, for mercy, for compassion, for love? Well then, I am all for the cross. And I will readily take up that cross, any day. It’s no wonder that this Jesus still has trouble attracting followers. It’s not an welcoming prospect. His logic, that seems so opposite all we have encountered in life. It invites us to find our purpose in serving others rather than in accumulating goods. It invites us to imagine that our life – and the lives of those around us – have infinite worth simply because God chooses to love us apart from anything we've done or not done. Why follow? Because, even when confronted by self-denial and death on a cross, it’s all about life, because the story of this Messiah doesn’t end there but concludes in an offer of eternal life to every life. Not the pseudo-life we've been persuaded by advertisers or politicians it's the best we can expect, but real, honest-to-goodness life. All we have to do is trade what we've been led to believe is life for the real thing. It's incredibly hard because so much money and energy has gone into convincing us that the best we can expect is a quid-pro-quo world where you get what you deserve. But if we can let it go, even for a few moments, we'll discover that God still loves to create out of nothing, raise the dead to life, and give each and all of us so much more than we either deserve or can imagine.